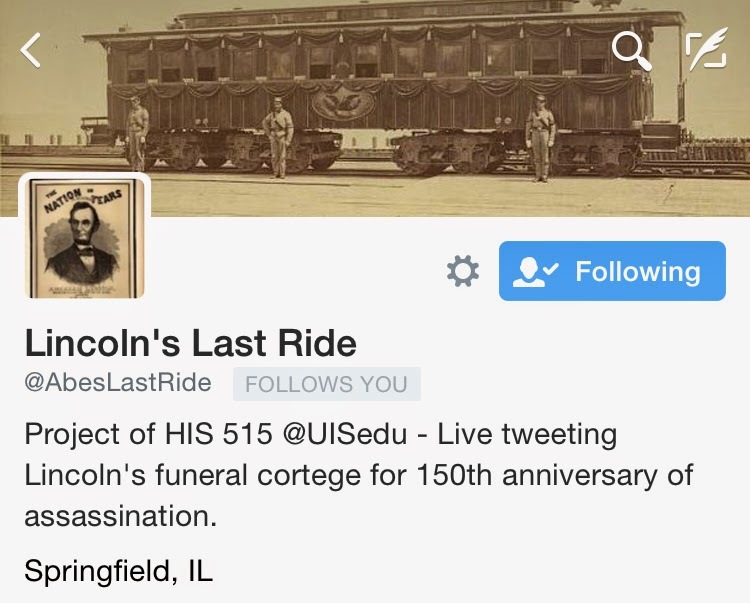 A University of Illinois Springfield history class is using Twitter to educate people about the events leading up to the assassination of President Abraham Lincoln and what happened following his death. Assistant Professor of History Kenneth Owen’s HIS 515 History and Digital Media class will be tweeting "as-live" coverage of Lincoln's assassination and funeral train back to Springfield. “We’ll be putting up tweets as events happened,” said Owen. Lincoln was shot just after 9 p.m. central time on April 14, 1865 and died the following morning. The majority of tweets on the @AbesLastRide account will begin after 7 p.m. on April 14. “Our tweets will start around the time Lincoln is going to the theater, but the bulk of the project will unfold over the next couple of weeks, as we trace funeral arrangements and public viewings as the funeral train makes its way to Springfield,” said Owen. Owen says the idea behind the History and Digital Media class is to introduce students to ways in which historical research and public history can be carried out through digital media, including online databases, Twitter feeds, blogs, podcasts, and crowdsourcing projects. “The idea with the Lincoln project was to think about how to present historical information in new ways. Condensing events to a series of 140-character tweets is challenging, both in terms of research and in writing,” said Owen. He says one of the most interesting aspects of the project is being able to see the interest it develops as more people follow the account. “I hope it will give students a real sense of accomplishment to see the project come to fruition and engage new audiences with the story of Abraham Lincoln,” he said.